Replacement wing mirror cover cap for the BMW 3 Series F30 & F31 type [2012 onwards]. Finished in smooth grey primer and ready to be painted to match your car. Clip In RH drivers side auto dimming electrochromtic aspheric heated replacement door mirror glass with integral plastic base plate for the BMW 3 Series F30 & F31 type [2012 onwards]. Clips into the mirror housing as original. 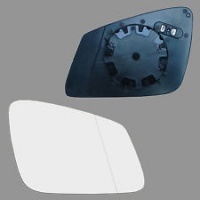 This auto dimming glass will replace BMW OE REF: 51 16 7186588. In appearance it doesn't have the ring around the edge of the glass but does have the dimming functionality and the extra connector plug. 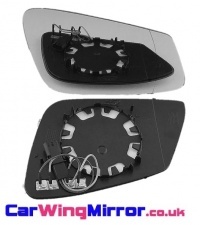 Self adhesive replacement wing mirror glass for the BMW 3-Series F30 & F31 type [2012 onwards]. Sticks over the existing broken mirror glass.